I know I am supposed to like play grounds. But my happy childhood memories of spontaneous kick-the-can games on suburban lawns make me a little wistful whenever I watch my twin 6-year-old sons in our local urban park. Sure, it's fun to swing and slide, but after a while there's not much new to glean. Turns out, there are other parents feeling unsatisfied by the same old playground equipment. Fortunately, one of them is the restless, preternaturally intelligent architect David Rockwell, designer of theater sets (Hairspray), restaurants (Nobu) and hotels (W). He was so frustrated by the fixed nature of the playgrounds his kids frequented that he set out to reinvent them. Rockwell spent five years consulting with experts on children and play, testing out his ideas at schools and then working pro bono with New York City officials to produce a play space that does something revolutionary: instead of prescribing activities  climb this, sit on that  the water-friendly environment encourages kids to be creative, messy, constructive and, yes, even destructive as they build with and topple giant foam blocks. Some of the 350 bright blue blocks at the Imagination Playground, which opened July 27 in a former parking lot in Manhattan, are shaped like wheels, others like cogs or giant noodles. The blocks can be used to make anything children can think of  a car, a river, a fort, a flower  and are deliberately big so kids will be more likely to assist each other with them. Visitors probably won't even notice that there are no swings or seesaws. The 12,000-sq.-ft. (about 1,100 sq m) multilevel space has plenty of room for running, climbing and other gross-motor activity: ropes dangle underneath the ramps that sweep around one side of the peanut-shaped playground. But the blocks and other movable materials provide ample opportunity to exercise the mind as well. A giant sandpit and nearby shallow pool are not just for digging and splashing but also for utilizing pulleys, wheelbarrows, plastic pipes and other tools. A gleaming steel crow's nest with a spiral staircase offers a quiet spot from which to view the action  and doubles as a storage site for the blocks, shovels, fabrics, etc. Rockwell's design, which was inspired in part by European "adventure playgrounds" where supervised kids can get creative with a wide variety of objects, follows the prevailing theory that free, child-initiated play is a critical component of healthy social, emotional and intellectual development. A leading missionary for that idea, Darrell Hammond  who heads the nonprofit Kaboom!, the largest builder of playgrounds in the U.S.  was so excited by the Imagination Playground concept when it was announced in 2007 that he cold-called Rockwell to suggest they create portable versions to enhance existing play sites around the country. 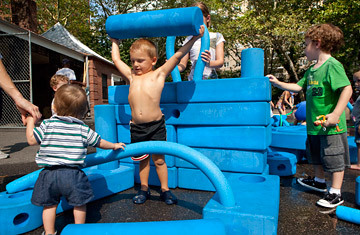 In 2008, two years before the opening of the New York City park, Rockwell and Hammond unveiled Imagination Playground in a Box, a walk-in-closet-size container with at least 75 foam blocks, among other components. The portable sets, which start at $6,150, now complement play spaces in such cities as Chicago; Honolulu; Yuma, Ariz.; and Winston-Salem, N.C., and have prompted calls from several mayors eager to build permanent Imagination Playgrounds. One additional expense is that both the portable and permanent versions need to be staffed by grownups. These so-called play associates are tasked with making sure kids use the equipment safely and, with any luck, keeping helicopter parents from hovering too close. Associates can also help prevent people from walking off with the loose parts. New York City has a mix of public and private sources to fund the staffers, who require training and earn at least $14.90 per hour. Other cities have relied on grants or volunteers. To Hammond, the greater cost would be not making a priority of this sort of children's play. "We view this as the start of a movement," he says. "When kids are the experts who design, tear down and rebuild their own scenarios, when there's no right or wrong way to play, it helps them deal with everything that happens in their worlds, and it builds a foundation for healthy, active lives." Most parents won't be thinking quite that deeply. But they seem to appreciate happy chaos when they see it. "It's good that it's messy," Molly Weinberger said recently as her two boys dug into an Imagination Playground in a Box that had been wheeled into an otherwise ordinary Manhattan park. "Not many kids now get to just go out and play with things that don't go beep or boop. " Her 4-year-old had used the blocks to fashion a 4-ft.-long (1.2 m) car with oddly shaped wheels and interior seating. He inserted a noodle into a hole in the side of the vehicle, but when I caught up with him to ask what he had been pumping, he responded quickly, "Now I'm finished with that." And he was. He was busy helping another boy spray water through a window in a fort they had just made. See 10 things to do in New York City.